Greetings from the World Headquarters of the Church of Zymurology! This is indeed an uspicious occasion as it is the eve of the arrival of nasty weather. But we have faith…and plenty of commecial as well as local brewed beer to sustain us during these trying times. On this occassion I will begin the evening with a Chocolate Stout brewed by Brooklyn Brewing Company from New York of which we here at the Church have several. For those that have not tried this delicious concoction it is well worth seeking out and contrary to both the label and taste does not contain chocolate at all – rather miraculous. Following the Brooklyn selection we anticipate delving into the finer points of well aged Bigfoot, the barleywine made by Sierra Nevada in Chico California. Recent study by our clergy scholars deemed 2002 a very good year and I must make sure they have nto been led astray by sampling one from our precious collection myself. 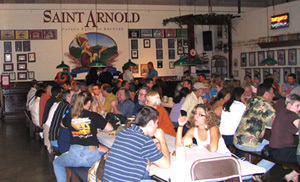 Tomorrow I shall attempt to brave the weather and possibly volunteer my humble services at Saint Arnold Brewing company in Houston which claims it has never missed a tour in fourteen years. Wish me luck and stop in should the winds of fortune blow you in that direction.